Eucalyptus caesia is commonly known as Gungurru. This Western Australian native is a small tree that may reach a height of nine metres if a single trunk develops. If the tree develops a mallee growth habit with multiple trunks then the height may be restricted to six metres. Our tree has a single trunk and is close to nine metres tall. Gungurru has a slender growth habit with pendulous branches and an open crown. The bark is initially smooth red-brown and when shed exposes the new bark that is greenish or yellow-brown. Leaves are narrow lanceolate, leathery, up to 12 centimetres long and grey-green. Stems have a frosted appearance. The large, stunning flowers are about three centimetres across, carried in groups of three and are red with yellow anthers. Flowering occurs between June and September and at this time attracts honeyeaters. Our plant (see image) flowered for the first time in July 2013. Blooms are followed by urn-shaped gum nuts that are 3 centimetres long by 2.5 centimetres wide. Both flowers and fruits are so heavy that they weigh down the branches. This accentuates the pendulous growth habit. Eucalyptus caesia is classified as rare and endangered. The species is found on or near isolated granite rocks in southern Western Australia. There is also a naturally occurring form, also rare, that has larger flowers and fruits with pendulous branches may reach the ground. This form is known as “Silver Princess” and is widely cultivated. Our plant appears to be the usual form. 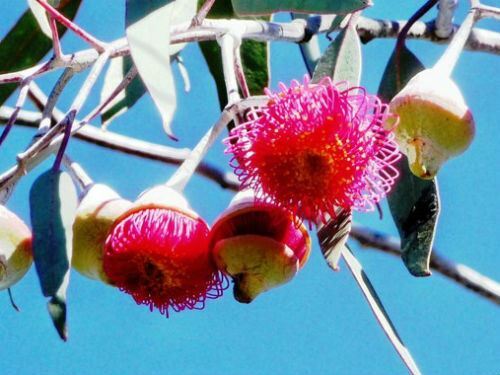 Regardless of which form you grow this is a spectacular eucalypt with attractive trunk, stems, flowers and fruits. Because both forms are widely cultivated there is no chance that the species faces extinction. In our harsh climate Gungurru could be damaged by frost. Our plant has survived and thrived because it is sheltered in one of our dense, diverse shrubberies. The species name means light grey and refers to the whitish bloom on stems, buds and fruits.